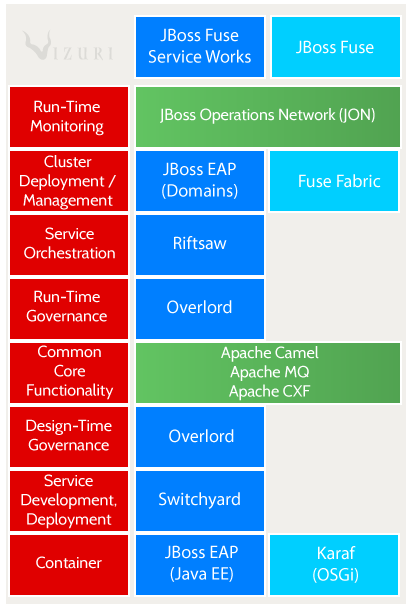 I saw a blog from Zack at Vizuri comparing JBoss Fuse vs Fuse Service Works. I thought it would be good to give a brief introduction to the integration products, A-MQ, Fuse and Fuse Service Works, and then share an excerpt from his blog on Fuse vs Fuse Service Works. I also included some links around Camel on EAP. Summary: JBoss A-MQ is a high performance, flexible, lightweight messaging platform. High performance messaging-A reliable messaging platform that supports standard messaging paradigms for a real-time enterprise. Cross-language and multi-protocol support-Allows native connectivity from applications written in Java, C, C++. Multiple transport protocols for exchanging data between applications, services and devices. Supports JMS 1.1, TCP, SSL, STOMP, NMS, MQTT, AMQP 1.0. Cloud ready-Deploy on premise, in the cloud or in a hybrid conﬁguration. Summary: JBoss Fuse is a lightweight integration platform. Pattern based integration framework-Leverage Apache Camel to provide a full-featured, easy-to-use and intuitive framework for quicker integration solutions. Dynamic configuration and management-Change configuration while container is running. Easily deploy or update services across nodes while the ESB is running. Multiple connectivity options-Connect to external applications with connectors for JDBC, FTP/SFTP, HTTP/HTTPS, ﬁle, SalesForce.com, SAP, Twitter, and more. Compose your applications from Enterprise Integration Patterns (EIPs) based on the popular Hohpe and Woolf EIPs. Integrate applications with SOAP, XML/HTTP and RESTful HTTP. Provides core messaging within the ESB and for integrating with other applications. Offers a lightweight OSGI-based runtime container for managing the components that compose your applications. Makes it simple to manage large and distributed, JBoss Fuse deployments from a central location. ​is currently heavily invested in Java™ EE 6 development. The Fuse Service Works service model is similar to that of JEE development. would like to take advantage of Java™ EE 6 components from your services. Since FSW is embedded in a JEE container, you have full access to JEE components such as persistence and the injection framework. uses JBoss Enterprise Application Server (EAP) for other components in your infrastructure. Administration tasks such as deployment, clustering, high availability are similar if not the same as that utilized for FSW. is looking for a robust design-time and runtime service governance platform. does not utilize the JBoss Enterprise Application Server Platform (EAP). uses the Apache Karaf container for other components in your infrastructure. Design-time or runtime service governance is not a major factor in your choice of an integration platform. This past Red Hat Summit 2014 I was honored to be able to work on a lab for Fuse Service Works with Keith Babo. I have moved the lab into a docker container so keep watching for the blog post of the Home Loan Application deployed to Fuse Service Works in a Docker container. 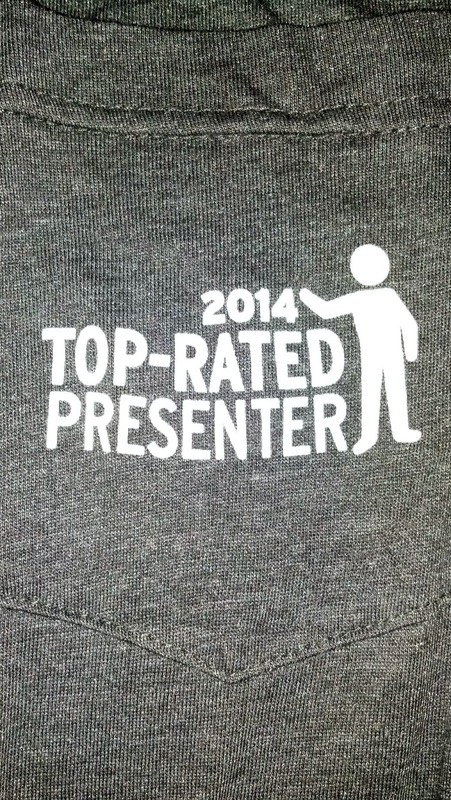 We were lucky to be one of the Top Presenters for Red Hat Summit 2014. I received my T-Shirt and wanted to reblog the location of the lab and the overview. We are adding more to it and building some starter kits. Any feedback is appreciated to improve our labs and make Fuse Service Works full of goodness. We look forward to having more detailed labs for Red Hat Summit 2015. In this session, we’ll walk you through the Red Hat Fuse Service Works home-loan application. This application processes a home-loan application through the system to arrive at a decision. The application uses multiple technologies, including Camel, business processes, and rules. Capture service activity through run-time governance. Build a SwitchYard application and use Camel, business processes, and rules in the application. Docker is a tool for building portable Linux containers around an application. If you are unfamiliar with Docker, or have heard of it but never used it, then you should definitely come to this session because containers are the new virtualization. Docker is a revolution in thinking about software distribution. It makes the process of creating images with the whole application stack (OS + application server + application itself) easy and extremely fast. You can share them easily too, and images behave the same way on different machines. Differences between development and production environments are a thing of the past. But that's not everything - Docker helps you run images too by providing an easy to use interface. Sounds like magic, huh? In this session, right after introduction to Docker, Marek will dive into examples showing how you can leverage this tool to create a deployment environment for your applications. You will see how to cluster JBoss EAP and deploy an application to it. Marek will share some tips and tricks too: for example how to manage logs or customize the configuration of JBoss EAP to be able to deploy your applications. Eric Schabell has started us out on a great demo with 2 of our Red Hat JBoss Middleware products. 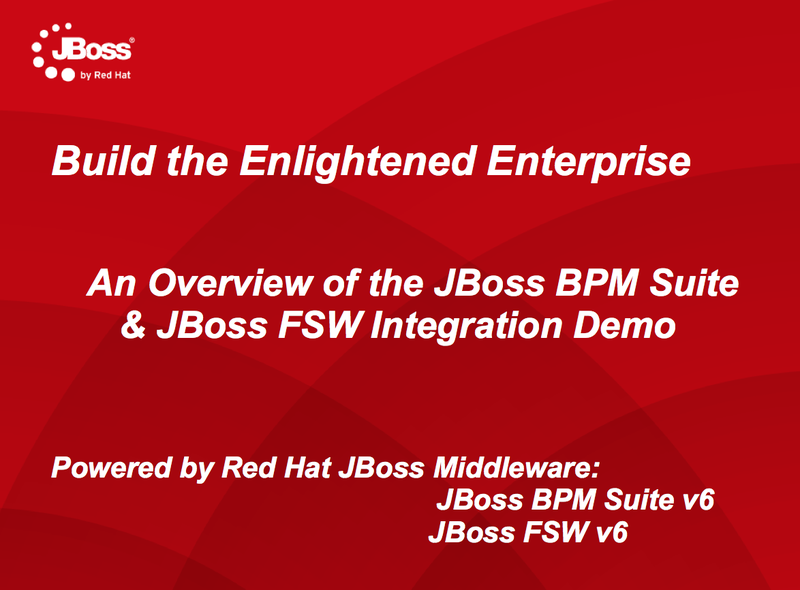 This demo shows off the integration between JBoss BPM Suite and JBoss FSW. This initial announcement provides an automated installation (repeatable) in minutes where you get JBoss BPM Suite running on an instance of JBoss EAP and a separate instance of JBoss FSW on its very own EAP instance. There are plans to expand this demo project with various integration scenarios or use cases, but for now we start with just a single story around using JBoss FSW governance integration to manage your rules, events, data models, processes, and other BPM artifacts. We will be expanding this project in the coming days to include a Switchyard services application that will leverage a Fuse camel route which in turn makes a call to a process running on JBoss BPM Suite. There will be more expansion such as calling a Switchyard services application from a BPM process and much more so stay tuned. The project can be found on github and has documentation to get you up and running in minutes. The FSW S-RAMP and DTGov installation is configured to automatically react to any deployments of the provided customer evaluation project, kicking off an instance of the process to start evaluating and approving or rejecting the artifact build for the next level of your infrastructure. 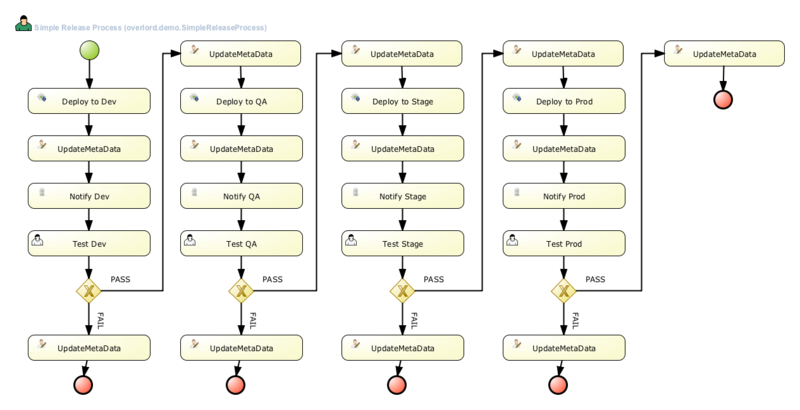 The current demo setup just uses the following file system locations to show progression but you can configure this to make use of existing continuous integration infrastructure in your own enterprise as needed. Vizuri has opened up a test drive on Amazon to see Red Hat JBoss Fuse Service Works and Enterprise Integration Patterns in Action. Isaac Christoffersen, Cloud Enablement Services Architect for Vizuri, is one of the organizers of the DC Area JBoss Users Groups - http://www.meetup.com/DC-JBug/ and let me know the test drive is available. A quick shout out to Kent Eudy for creating the JBoss Fuse Service Works Test Drive. Vizuri created this Red Hat JBoss Fuse Service Works Test Drive - to make it easier for you to jump right in and gain valuable insight solving common integration problems. Order Management System (OMS) – The OMS is responsible for providing order and inventory services. eCommerce – The eCommerce system is responsible for placing orders over the Web and from mobile devices. Point of Sales (POS) – The Point of Sales system is responsible for placing orders at retail locations. EDI – The EDI system is responsible for taking bulk order via EDI files. In this Test Drive, we will demonstrate Enterprise Integration Patterns (e.g., Message Translator, Message Broker, and Messaging Gateway) implemented using the Fuse Service Works platform and tools to easily solve this integration problem. 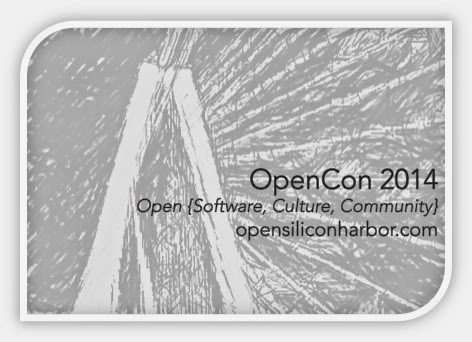 OpenCon is taking place on September 17th 2014 at the Footlight Theater, Downtown Charleston. OpenCon 2014 will feature a one day agenda with representatives from both the government and commercial sectors. Take a look here for this years agenda and to keep updated on the speakers, panels and Ignite speakers. I will take part in 2 different sections during the event. First I will take part in the PaaS Industry panel from 1:45pm to 2:45pm. We will discuss the latest on Platform as a Service. Second I will take part in the Ignite talks which are from 3pm-4pm. Ignite is a presentation format that is shorter than the Pecha Kucha format, a presentation style in which 20 slides are shown for 20 seconds each, but longer than lightning talks, which are short presentations from five to 10 minutes in length. At an Ignite event, each speaker has a time limit of five minutes, and must use 20 slides with each slide advancing automatically after 15 seconds. This forces speakers to maintain a rapid pace. At a just-comprehensible clip of 160 words a minute, Ignite speakers can utter about 40 words per slide, making a total of 800 words for the complete talk. At OpenCon the audience will have beer. I will do my Ignite talk on Fuse Service Works on Docker. The video below is a good example of Why and How to give an ignite talk. Figure out your points before you make slides. 300 seconds is easy to practice. Don’t get hung up on slides. Make your talk fault tolerant. You can hack the format. Plan to lose your first and last slide. You can find royalty free images to use. I am excited to be able to attend and be involved in Devoxx Belgium this year. I will be leading a birds of a feather talk in the Web and HTML 5 Track. 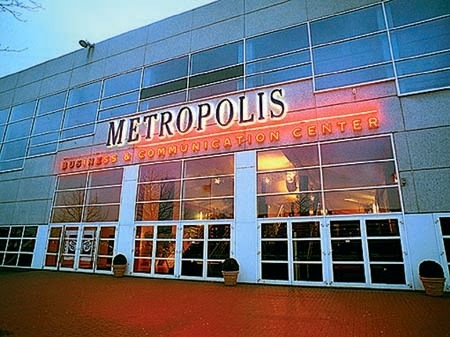 This years Devoxx BE 2014 will be on November 10th - 14th in Antwerp, Belgium and takes place in the second-biggest European cinema complex, the MetroPolis. As a result, the speakers' video and slides are projected on the huge cinema screens using the available THX audio setup. It is one of the biggest Java events in the world, make sure to mark your agenda and register today! The Devoxx family (Antwerp, Paris and London) welcomes annually 5.750 Devoxxians! An additional 1.950 children experience the Devoxx4Kids magic through chapters all over the world. During 5 days in Belgium, 3.500 Devoxxians from 40 different countries attend Devoxx Belgium including 200 speakers and another 345.000 developers enjoy the presentations online. Making Devoxx one of the biggest Java conference in the world! Birds of a Feather (BoF) sessions provide face-to-face exposure to those interested in the same projects and concepts. BoFs can be organized for individual projects or broader topics (best practices, open data, standards). BoF sessions are smaller and more informal than technical and business sessions. They are typically led by one or two speakers and are held in the evenings. Some BOFs may open with a short presentation followed by a question-and-answer section, while others take the form of open, "round-table" discussions about particular topics of interest to the Java technology developer community. IoT describes the ability to transfer data over the network with messaging without human-to-human or human-to-computer interaction. To transfer the data, protocols such as MQTT (Message Queue Telemetry Transport) and AMQP (Advanced Message Queuing Protocol) can be used. WebSockets can be used as a standardised way to communicate asynchronously between a web page and a server. The IoT protocols can be used to transfer data over WebSockets. The Machine to Machine (M2M) messages would be handled by a messaging and integration patterns server such as ActiveMQ. This session will provide an overview of messaging protocols like MQTT and AMQP and how these protocols can be used over WebSocket to transmit data. Design patterns and anti-patterns of different messaging protocols and architecture will be discussed in detail. The session will also show how these protocols were used in a real-life application with a Raspberry Pis cluster. Attendees will learn practical advise on how to configure Raspberry Pi and brokers for an optimized setting.